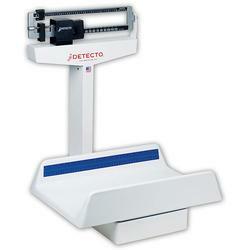 Easy-to-clean polystyrene trays cradle babies securely on these dependable, portable scales. The 450, 451, and 459 give a choice of pounds or kilograms or both. Light and attractive scales, these models features a heavy-duty, rust-resistant understructure and dual-reading, die-cast beams.